Vientiane (Lao PDR) October 28, 2017 (travelindex.com) – Lao Prime Minister Thongloun Sisoulith launches the “Visit Lao Year 2018” at the opening of the annual That Luang Festival in Vientiane. Lao PDR officially launched the “Visit Lao Year 2018” on Saturday, October 28, 2017 aiming to promote tourism and preserve the unique and fine traditional culture of Laos. Laos launched its “Visit Laos Year 2018” to promote the tourism industry and revive interest in the country at a time when visits are declining. According to the Director General of the Tourism Marketing Department, Ministry of Information, Culture and Tourism, Sounh Manivong, the Visit Laos Year 2018 campaign will be hosting a number of high ranking officials and journalists from other countries. Colorful festivals and events depicting Laos’ diverse cultural, traditional and natural charms are set to be highlighted through Visit Laos Year 2018. In his speech H.E. 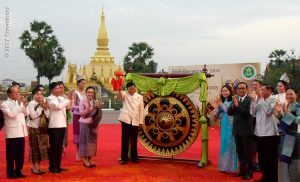 Professor Dr Bosengkham Vongdara, Minister of Information, Culture and Tourism, Vice President of National Committee for Visit Laos Year 2018 said: “…The festival does not only reflect the fine traditional culture of Laos but also commemorates the success of the fourth restoration project of That Luang Stupa and That Luang Stupa consecration ceremony. Tourism is an economic sector which has expanded rapidly in several countries around the world. At present, many nations in the world attach special attention to develop and promote their tourism as well as consider tourism a priority economic sector for the socio-economic development of their nations. Over the past years, the government of Lao PDR likewise come to regard tourism as a priority sector for driving the socio-economic development of the country. Tourism brings spending on goods and services that can boost currency reserves and circulation of money in the country and create more job opportunities for people in service and production sectors, particularly agriculture and handicraft production. Tourism is a form of export and generates income to local and rural communities in remote regions. Additionally, tourism pushes for direct and indirect investments and businesses including tour business, hotels, restaurants, transport, souvenirs and so on. Tourism also pushes investments in infrastructure development such as roads, airports, ports, telecommunication systems, electricity, water supply and so on. Moreover, the government considers tourism development and promotion as a means for expanding and enhancing cooperation between Laos and foreign countries. The government has determined the directive for developing and growing natural tourism, historical and cultural tourism based on the Slogan of ‘Visit Laos Year 2018’: “Visit Laos, Experience the Diversity of Nature and History. 5 – Promote the development of small and medium enterprises.